You are here: Home / Blog / News / New Year, New Rules at Beacher’s Lodge! 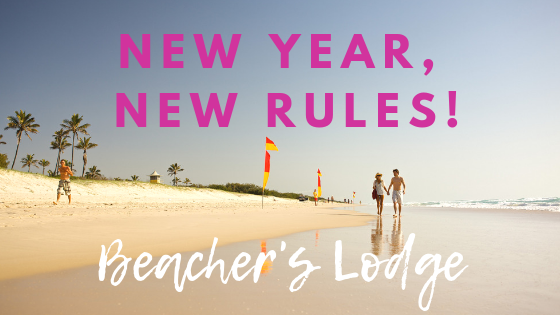 New Year, New Rules at Beacher’s Lodge! Our guests are our priority. In order to guarantee a pleasant stay at Beacher’s Lodge for everyone, we are sometimes required to implement regulations. Let’s work together to make sure Beacher’s Lodge remains the beach paradise it is! Our pool is currently under renovation but will open again soon. Once renovation is complete, the pool will be open from 8am until 30 minutes before sunset. We know many of our guests have enjoyed night swimming in the past, so we are working with an engineer to see what lighting can be implemented to accommodate night swimming while still being safe for our turtle-friendly environment. It’s our utmost priority to keep our wildlife safe for generations to come. Please be patient while we spend time making our pool area the fun, safe area we know you all enjoy. Beacher’s Lodge is one of the few vacation condominiums that allows your furry friends to stay. We would love to keep it that way. As a reminder, Beacher’s Lodge allows a maximum of 2 pets per unit. If any pets are found to be disruptive, even in the owner’s absence, the owners will be required to correct the situation – even if it means returning to the unit to do so. Nobody likes stepping in a mess left by a pet. Out of respect for your neighbors, please kindly clean up after your pets. Our property has one designated outdoor pet area, and it is behind the conference room. Please note that the grassy area in front of the first-floor patios is not a designated pet-walking area. We love having Fido over to visit with us, and we know it’s important to you, our guests, to be able to bring them along. We want to make sure everyone’s stay is comfortable, relaxing, and memorable. Please help us by following these rules. We want our guests to have a safe and clean environment in which to enjoy their vacations. In order to ensure that, the property has just passed a policy stating there is no smoking allowed on balconies, walkways, or in the pool area. We do offer a designated smoking area right next to the pet-walking area behind the conference room. Some of our guests are very sensitive to cigarette smoke, so please help us make their stay just as enjoyable as yours. As we all share Beacher’s Lodge outdoor space, it’s imperative that we keep smoking in the designated areas. We would like to thank all our guests for their cooperation in adhering to our new policies. Here at Beacher’s Lodge, we pride ourselves in making everyone’s stay one to remember. If you have any questions regarding the new policies, please let us know and we would be more than happy to assist you.